How much will you scrap this year? Carrie Arrick of the Digi Scrap Geek podcast had a thought provoking (and cool!) post where she analyzes the pages she made 2014. Carrie’s post inspired me, but I set off in a different direction. Rather than reviewing 2014, I began to plan out my scrapbooking for this year, 2015. Now before you stop reading, I have to say something about planning. You don’t need to plan to scrapbook. In fact, too much planning, like too much organizing and shopping can prevent you from even getting started and gaining momentum. 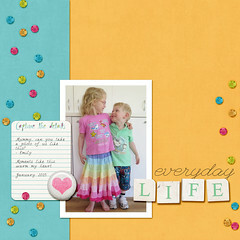 I plan my scrapping because I want to, and for me it’s a way to make sure I put aside the time to scrap. You don’t need to do any planning, unless you want to because it helps you make scrapping happen. I’m happiest when I scrap and print my pages regularly. So this year, as I do most years, I am planning time to scrapbook and to print my layouts. Today I’ll share my plans for scrapping. There’s a couple of aspects to my planning: 1. A time to scrapbook 2. 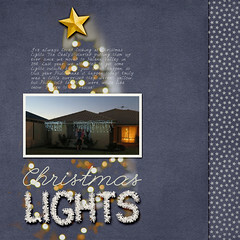 Projects to scrapbook. As a wife, mum of three, homeschooler and business owner scrapbooking time doesn’t grow on trees. Inspiration strikes much more often then I can actually sit down to scrap! But instead of letting that worry me, I’ve chosen a couple of times a week to allocate to scrapbooking. 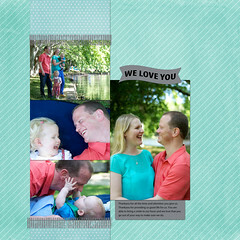 I typically spend an hour on each layout so I use that as my basic scrapping time. Like many scrappers I enjoy scrapbooking on Sunday and even started posting my layouts with #ScrappingSunday on Instagram and Facebook. I’d love you to join in and share your pages too! I also set aside an hour on Wednesday to do some scrapbooking. Throughout the year, I like to take part in Layout a Day, so I’ll add an hour of scrapbooking time each day for February and October. Then there’s a monthly craft group I attend, where I scrapbook my memorabilia in pocket pages. Each year I itch to try traditional project life weekly spreads, and have completed a few here and there. But if I was to commit to doing weekly Project Life style pocket scrapping, that’s all I would be able to fit in to a normal week. So that begs the question… what do I want to scrapbook? As scrapbookers, our work is never ‘finished’. There’s always one more story, day, event, moment or photo to document. I tend to scrap random pages rather than going in chronological order or even doing specific projects. You may feel motivated by ongoing projects or themed albums, so your list of projects to work on may look different than mine. I have just one ongoing project on my plate for 2015, my little Lucy’s baby book. 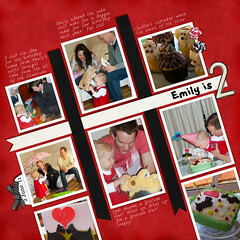 I have three small children, so since 2009, I’ve been working on baby scrapbook albums! 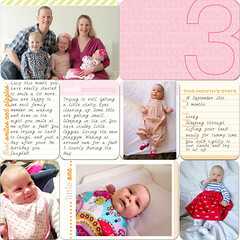 Each month for Lucy’s first year, I have been creating a page for her, as she’s 6 months now, I’ve got 7 more to do, then the cover and some collage pages to showcase more cute baby photos! I’ll also do a page when she begins walking and for her first birthday party. So let’s say about 10 pages for Lucy. I said I don’t have ongoing projects, but I do like to record certain things throughout the year that my family and I enjoy looking at. With the exception of my Christmas album, they aren’t big projects, and some of them I even create on my phone with the Project Life App. The 10 pages I mentioned above for Lucy’s album. All up this will total about 60 pages. So that means even if I have no more ideas for pages, I’ll need to scrap more than one page per week to create them all. I don’t want to over-plan my layouts, so there’s leeway to scrap whatever I like. The other 40 or so layouts I create will be prompted by activities, moments or challenges that I participate in. My schedule is to allow time for the joy of creating! 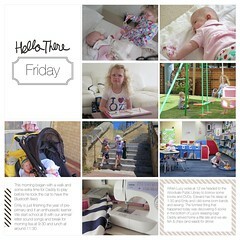 Upload them to the Daily Digi’s Digital Scrapbooking Flickr Group to share the inspiration! So what do you think about planning your scrapping? Do you use a routine? Do you plan what pages you create? Do you prefer ongoing challenges? I’d love to hear how you will plan to make time for the joy of creating.